Expectoration of a foreign body in cough can be quite alarming and baffling, although well reported. Pieces of bullets, surgical staples, gallstones, and tumor masses ,,, have been recovered with cough and the diagnosis become clearer in the light of the patient's clinical profile and the past history. However, expectoration of a prosthetic graft used in the cardiac surgical procedure years earlier is extremely rare. We document such an occurrence in an asymptomatic child. An eleven-year-old boy presented for cardiac consultation with a foreign body that he had coughed up a week earlier. He reported a sudden bout of cough that brought out this unusual material, which was blood-tinged but denied any history of significant hemoptysis, fever, or chest discomfort. There was no recurrence of symptoms and he did not seek any further medical attention locally. The foreign body was the entire prosthetic vascular graft [Figure 1] with sutures at either end and was easily identified as the graft of a Blalock-Taussig (BT) shunt. The patient was diagnosed to have tetralogy of Fallot (TOF) at birth and had undergone BT shunt procedure for recurrent spells at the age of nine months. Subsequently, corrective surgery for TOF was done at the age of 2 years. The BT shunt was occluded by ligating in the middle, as is routinely done at the time of corrective surgery. At the postoperative follow up 6 months later, right pulmonary artery stenosis was identified that required a balloon dilatation with relief of gradients. The right ventricular systolic pressure fell to 60 mmHg (from 100 mmHg), and the relief was maintained at further evaluation 6 months later. The patient was lost to follow up thereafter, but was asymptomatic until the present episode. His present physical examination showed heart rate of 84 /min, blood pressure 100/70 mmHg, and a precordial ejection systolic murmur. The chest X-ray showed cardiomegaly, dilated pulmonary artery segment, and normal lung fields. The echocardiogram was consistent with the postoperative TOF but showed significant pulmonary regurgitation, mild tricuspid regurgitation, smaller right pulmonary artery, and mild right ventricular dilatation and dysfunction. 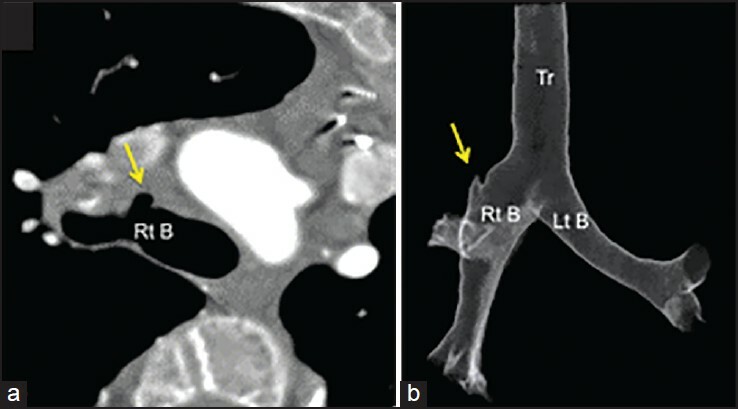 A CT angiogram documented normal right subclavian artery, smaller but normal right pulmonary artery with no focal stenosis, or pseudoaneurysm. There was no pneumomediastinum, any soft tissue shadow, or evidence of inflammation in the lungs. [Figure 2] A doubtful irregularity in the right upper bronchus was noted in light of his history, [Figure 3] but airways were generally unremarkable. No active intervention was done. The complications of a BT shunt include thrombosis, anastomotic stenosis, subclavian or pulmonary artery pseudoaneurysm, pulmonary artery distortion, seroma, and infection. The inability of the graft to grow with the growth of the patient is a disadvantage, and whether it played any role in the spontaneous migration of the graft years later is conjectural. All reported cases had shunt expulsion several years later. As such, the mechanism of BT shunt migration in all cases remains unclear. In one case, infection around the graft and pressure necrosis of the bronchus with growth was incriminated,  and pneumonectomy stump was thought to have facilitated the expulsion in another. Fortunately, the expulsion in our case and in 2 of other reported cases also, was almost "uneventful" after the initial fright. , The outcomes in all cases have been remarkably excellent. Thus, a vascular conduit can migrate and erode the bronchus without the presence of psedoaneurysm, host artery occlusion, or severe bleeding. ,,, , Whether any technical factor was common to these reported cases of BT shunt migration is not known. In conclusion, we document an extremely unusual occurrence of spontaneous expectoration of a BT shunt in an asymptomatic child a decade after the original operation. Saunders MS, Cropp AJ, Awad M. Spontaneous endobronchial erosion and expectoration of a retained intra thoracic bullet: Case report. J Trauma 1992;33: 909-11. Yadav RK, Yadav VS, Garg P, Yadav SP, Goel V. Gall-stone expectoration following laparoscopic cholecystectomy. Indian J Chest Dis Allied Sci 2002;44:133-5. Panselinas E, Judson MA. 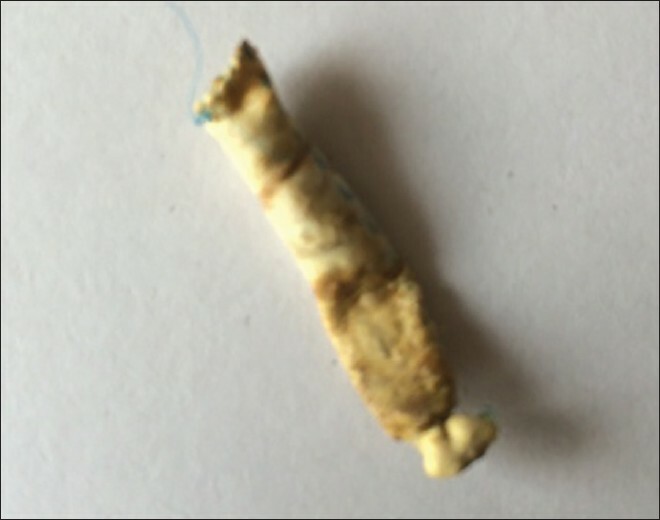 Staple metalloptysis after lung resection for mycetoma: A case report and a review of the literature. Am J Med Sci 2008;336:365-7. Terashima M, Nishimura Y, Nakata H, Iwai Y, Yokoyama M. Spontaneous coughing up of a polyp. Respiration 2000;67:101-3. Carrel T, Winklehner H, Pasic M, Turina M. Spontaenous expectoration of a prosthetic graft nine years after a Blalock-taussig shunt procedure. N Engl J Med 1993;329:1899. Rumman N, Berger S, Rao A. Hemoptysis in a teenager with congenital heart disease. Pediatr Cardiol 2011;32: 105-7. Lodge JP, Hamilton JR, Saunders NR, Walker DR. Right lower lobe consolidation: An unusual complication of modified Blalock-Taussig operation. Ann Thorac Surg 1987;44:201-2. Kaneko Y, Kobayashi J, Masuzawa A, Yoda H, Inage A, Tsuchiya K. Bronchial migration of a systemic-pulmonary shunt conduit. Ann Thorac Surg 2006;81:1892-3.